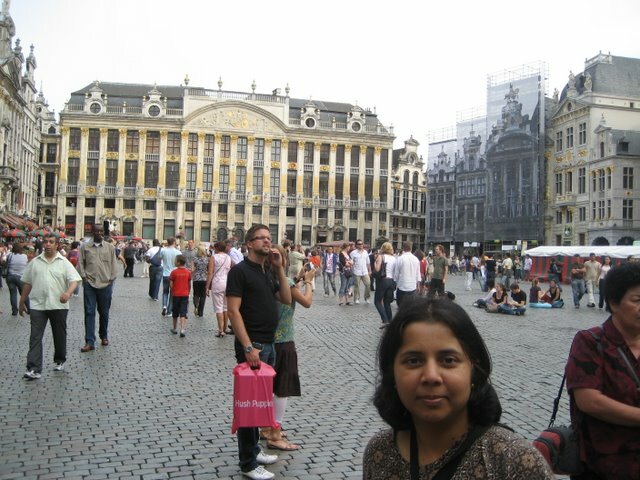 We spent the last weekend in July in Brussels, which is the capital of Belgium and also the European Union. We have been there once as part of an organized European tour. So we were looking forward to explore at our own pace. We arrived there on a Saturday morning. It was overcast and raining. We hadn’t kept the phone number or address of our hotel and we wanted to avoid taking a taxi, if possible! So we took the only train from the airport to downtown and on the train, PK was frantically searching for the phone number and subway maps on his blackberry. We finally talked to the hotel and got directions to reach there. After a few hours nap, we headed out in the evening to the Grand Place. It is the Central Maket Square and is pedestrian-only. All the surrounding area is full of cobbled stone streets with lot of cafes and souvenir shops. We hung around here for a while and then we walked to the statue of Manneken Pis. After the customary picture, we walked back and sat in the square, this time with the famous Belgian Waffles and Belgian beer for PK. The weather was pleasant and we could have sat there forever, but we had to head back since it was approaching the kids’ bed time. The next day, we headed to Mini-Europe. I went with big hopes but was a bit disappointed. 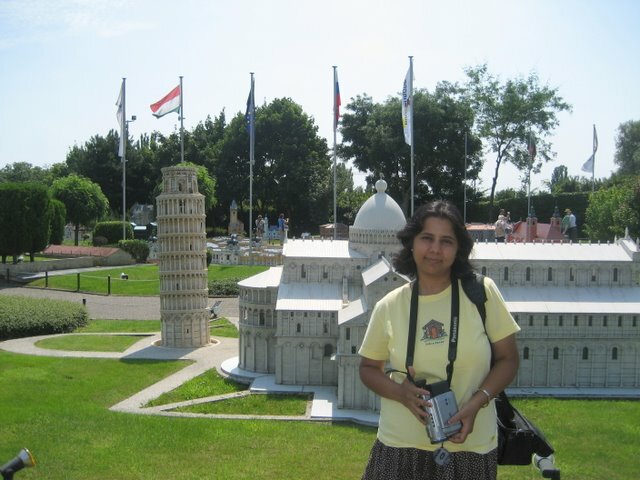 I can’t pin-point why, exactly, but it didn’t make such a memorable impression on me (I was so awed by Madurodam). The park was smaller than I expected and the models were all too close by. It was a hot day too. We slogged through most of the models and had lunch at the cafeteria. Little more sight-seeing after that and it was time for an ice-cream stop. After that, we walked over to the Atomium. 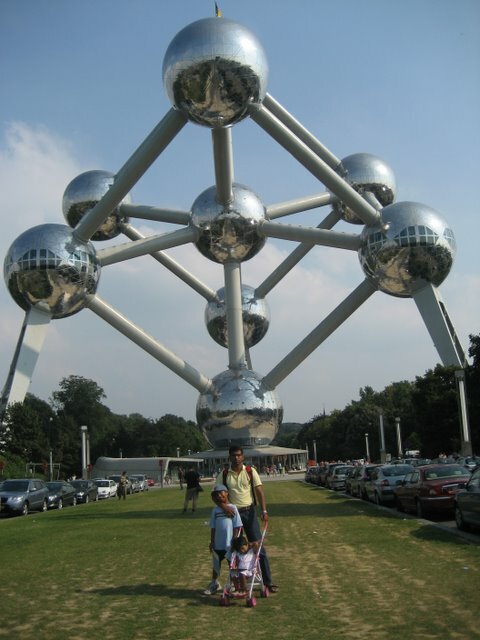 It is a monument with 9 steel spheres connected to look like an iron crystal. Since SK was napping, PK volunteered to stay with her while AK and I decided to take the elevator to the topmost sphere for panoramic views. The long lines discouraged me but the man at the ticket counter assured me that it would move very fast. He LIED! We were in line for well over an hour before we got to go up. Once we were there, the space was so congested – not like the spacious observation decks I have seen on the Space Needle, CN tower etc. And it was extremely hot. So pretty much, as soon as we reached up, we were back in line to go down. Overall, it was a waste of time and money. Grand Place is a great place to spend evenings, so we headed back there. We payed an atrocius amount for a veggie pizza. For much of the dinner, we wondered how the Europeans afford to live there. Even discounting the weak dollar, things are so much more expensive. The restaurants don’t serve regular water either. So you always have to buy bottled water and on hot days, a family of four can drink a lot! A weekend was just the right amount of time to spend. We were able to see everything without feeling rushed.